Barry Farber is the president of Farber Training Systems Inc. and The Diamond Group. He’s a Sales Strategist for Business Leaders, Sports Legends, Entertainers and Fortune 500 Corporations. 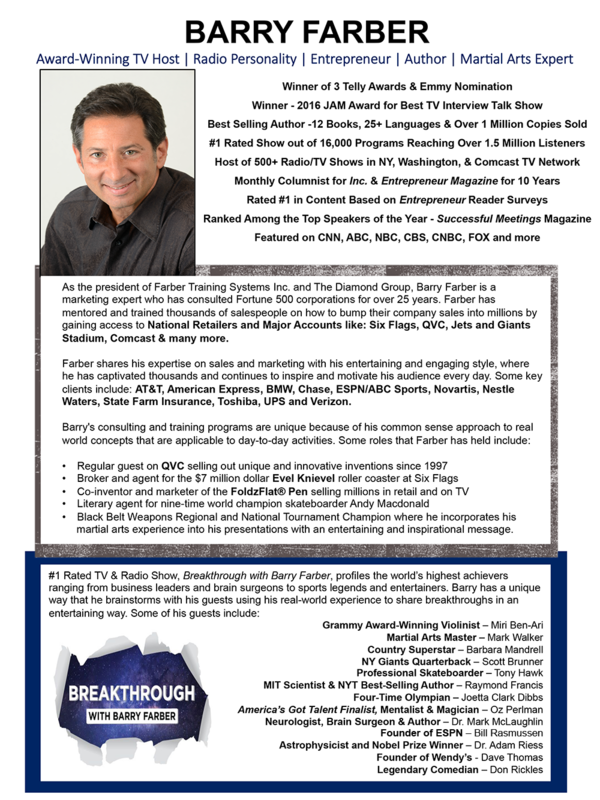 For over 25 years he’s generated millions of dollars of new business for clients by gaining access to National Retailers and Major Accounts like Six Flags, QVC, Jets and Giants Stadium, Comcast and much more.What makes Barry’s consulting and training programs unique and practical are the real world applications he shares from his day-to-day activities. He can be seen as a regular guest on QVC selling out unique and innovative inventions since 1997, he was the broker and agent for the $7 million dollar Evel Knievel roller coaster that Six Flags Theme Parks launched the summer of 2008, winner of 3 Telly Awards and nominated for an Emmy as the Executive Producer of the Jackie Mason Television Show, Co-Inventor and Marketer of the FoldzFlat® Pen selling millions in the promotional, direct response and retail markets, literary agent for eight time world champion skateboarder Andy Macdonald and Black Belt Weapons Regional and National Tournament Champion where he incorporates his martial arts experience into his presentations with an entertaining and inspirational message. For over 25 years Farber has trained and consulted fortune 500 corporations, business owners, professional athletes and entertainers helping them market their products and generate more business. He has trained over 500,000 salespeople and helped companies increase their sales by over 50% while helping them gain access to millions of dollars of new business. Some of his clients include AT&T, American Express, BMW, Chase, ESPN/ABC Sports, Novartis, Nestle Waters, State Farm Insurance, Toshiba, UPS and Verizon. He was rated as the “Top speaker of the year” by Successful Meetings Magazine and is the Best Selling Author of 12 books in over 25 foreign languages with over one million copies sold. His latest book, Success Secrets of Sales Superstars was released by Entrepreneur Press. His new TV show Breakthrough can be seen on the Hometowne Television Network and is currently being syndicated for national and international distribution. Barry hosted over 400 Radio and Television shows in New York City, Washington and on the Comcast Television Network. Some of his guests include: Don Rickles, Barbara Mandrell, Evander Holyfield, Astrophysicist and Nobel Prize Winner in Physics, Dr. Adam Riess , Rita Rudner, and Johnny Bench. 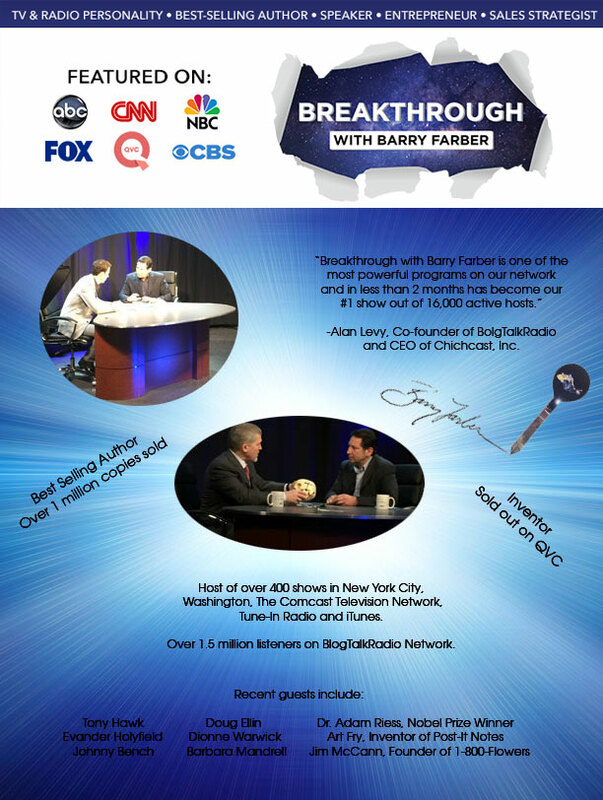 Barry’s radio program, “Breakthrough with Barry Farber” has over 1.5 million listeners and was rated the #1 show on the network out of 16,000 programs. In addition to hosting his own show Farber has been interviewed on CBS, NBC, ABC, FOX, CNBC and CNN. He has also been featured in Ad Week, Investors Business Daily, Newsday, U.S. News & World Report, Variety and The New York Times. Barry is a columnist for Inc magazine and has written over 500 columns for publications like Entrepreneur and Sales and Marketing Management. • Best Selling Author of 12 books in over 25 foreign languages with over one million copies sold. • Regular Guest on QVC selling out unique and innovative products since 1997. • Host of over 400 Radio and Television shows in New York City, Washington and on the Comcast Television Network. • Monthly Columnist for Inc Magazine and previously Entrepreneur Magazine for 10 years and rated #1 in content by reader surveys. • Rated as one of the top speakers of the year in “Successful Meetings” magazine cover story. • Black Belt Weapons Regional and National Tournament Champion. • Featured on CBS, NBC, ABC, FOX, CNBC, and CNN. • Agent and Broker for the $7 million Evel Knievel roller coaster that Six Flags Theme Parks launched summer 2008. • Winner of 3 Telly Awards and nominated for an Emmy as the Executive Producer of the Jackie Mason Television Show. • Featured in Ad Week, Investors Business Daily, Newsday, Selling Power, U.S. News & World Report, Inventor’s Digest, Variety and The New York Times. • Literary agent for the autobiography of Andy Macdonald, crowned skateboarding’s world champion 8 years in a row and owns 19 X Game medals – more than any other skater. • Manager of Trigger Gumm, the Guinness Book World Record holder for the longest Motorcycle jump at 277.5 ft. (Also holds the record for height in jumping and going vertical at 80 feet in the air). • Barry Farber’s keynotes, seminars and consulting programs focus on the art of “breaking through” in sales, marketing, customer service and new business development. What makes his programs unique is his real world experience ranging from marketing his own inventions on QVC, representing Major League Baseball players and entertainers with their products, to helping corporations gain access to major accounts and close millions of dollars worth of business. • All of his programs are customized to meet the goals and objectives of each organization along with research done in the industry so he understands their business environment. Barry started his own business in 1990 after working as the National Sales Training Manager for Ricoh Corporation and National Sales Trainer at Sharp Corporation. Prior to these positions he was a top sales representative and sales manager in the office products industry.